With RebelBetting you can bet on sports and profit every time. 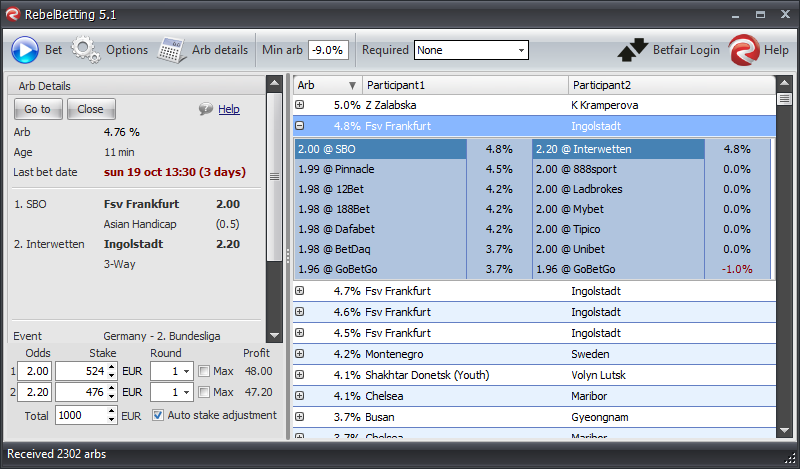 Using sports arbitrages (surebets) you can turn sports betting into a way of investing, with regular profits above 10% per month. It doesn't require more than a few minutes per day, and you can work from anywhere as long as you have a computer with internet connection. Please note that this is not gambling, or a "betting system" that only works until your luck runs out. This is an investment method. After you've placed your bets, you are guaranteed a profit. Luck has nothing to do with it. You win every time. Download the free e-book at RebelBetting that explains how and why it works, and teaches you everything you need to know to get started. You have nothing to loose, the software and the e-book is free!